May is National Bike Month-Ride Safely! 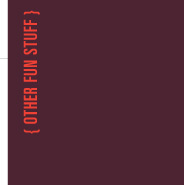 Welcome to the Doc Grubb newsletter for May-June 2012. There are many events and two special holidays in May and June, to include Mother’s Day and Father’s Day. But May and June are also when children get out of school so I am also talking about bicycle safety, for kids and dads, allergies and sunburn. Although many parts of the world suffer environmental disasters such as tornados, earthquakes and floods, it is also important to look at how to stay safe in our own neighborhoods and to know what to do if you suffer from allergies or stay in the sun too long and get sunburned. I wrote about the importance of WATER last year and have repeated it in this newsletter because it’s so important! Water in many parts of the world is the MOST precious commodity. You can live without food for weeks, but you can only live without water for a few days. You may already know SOME of this information, but read it again. We only retain 10% of what we read the first time so the more times you read it, the more likely you are to remember it. May is National Bike Month. The weather is getting warmer but before you and your dad pull your bikes out of the garage, let's be sure you know about Bike Safety. Bike riding is a lot of fun, but accidents happen. Every year, about 300,000 kids go to the emergency department because of bike injuries. Some of these injuries are so serious that children die, usually from head injuries. ALWAYS Wear a Properly Fitted Bicycle Helmet. Bike helmets today are lightweight and come in cool colors. Personalize your helmet with some of your favorite stickers. Reflective stickers are a great choice because they look cool and make you more visible to people driving cars. You don't want your helmet to be too small or too big and never wear a hat under your bike helmet. Wear your helmet level covering your forehead. Don't tip it back so your forehead is showing. Always fasten your straps! If the straps are flying, it's likely to fall off your head when you need it most. Don't throw your helmet down. That could damage the helmet and it won't protect you as well when you really need it. If you do fall down hard be sure to get a new helmet because they don't work as well after a major crash. Adjust Your Bicycle to Fit. Stand over your bicycle. There should be 1 to 2 inches between you and the top tube (bar) of a road bike and 3 to 4 inches if a mountain bicycle. The seat height should be adjusted to allow a slight bend at the knee when the leg is fully extended, and the seat should be level from front to back. The handlebar height should be at the same level with the seat. Be Bright. Whether daytime, dawn, dusk, foul weather, or at night, you need to be seen by others. Always wear something that reflects light, such as reflective tape or markings, or flashing lights, neon, fluorescent, or other bright colors when riding day or night. A yellow reflective vest is a great item to wear! Stay In Control of Your Bike. Always ride with at least one hand on the handlebars. Carry books and other items in a backpack, bicycle basket or carrier. If a backpack is too heavy it will make it harder to balance riding your bicycle. Avoid Road Hazards. Be on the lookout for things that can make you crash such as potholes, broken glass that might blow out a tire, gravel, puddles, leaves, and dogs. Yell out and point to the hazard to alert the riders behind you if you are riding with friends and you are in the lead. Don’t Ride Your Bike at Night. It is far more dangerous to ride at night than during the day because you are harder for others to see. If you have to ride at night, wear something that makes you more easily seen by others. Wear a reflective vest and/or a bright white, yellow or orange jacket and have reflectors on the front and rear of your bicycle and on your tires. Obey All Traffic Laws. The rules for a bicycle are the same as the ones your parents follow when they drive a car. When you ride in the street, obey all traffic signs, signals, and lane markings. Ride in the same direction as cars, stop at lights and stop signs an always be aware of the cars around you. Be Predictable. Ride in a straight line, not in and out of cars. Signal your moves to others. Learn your hand signals and use them! Be cool – be safe when you ride! Childhood asthma in the United States has reached epidemic proportions. Asthma affects 1 out of 13 kids under 15 (5.5 million children). Asthma is one of the leading causes of missing school, about 10 million days of school a year. Asthma also causes 2 million emergency room visits every year and approximately 5,000 children die from acute attacks of asthma every year. Childhood asthma can be very harmful to your child. Asthma disrupts your child's life by bothering them when they play, go to school, and while they sleep. Symptoms of childhood asthma should be taken very seriously and it’s important that you identify childhood asthma symptoms early. If untreated, childhood asthma can lead to very serious and sometimes life-threatening asthma attacks. trouble sleeping - your child can’t breathe properly while sleeping if their breath is short or wheezy and they wake up gasping for air. Struggling to recover from flu or a respiratory infection. A hard time breathing when they perform physical activities such as playing or running may mean they have exercise-induced asthma. If any of these symptoms are severe and your child starts gasping for breath, don’t hesitate to contact the doctor immediately or head straight to the emergency room. Don’t forget. You and your child probably had a lot of questions when your doctor first told you that your child had asthma. Talking with your child in a positive and open way to explain what asthma is and how it can affect him or her. Your child doesn’t have to be frightened about having asthma or feel that he or she can’t do things that children without asthma can do. It’s important for your child to understand you can prevent asthma symptoms and attacks by taking medicines. The more comfortable and knowledgeable your child is in talking about how he or she feels, the easier it will be for you to keep track of their symptoms and condition. I talked in the kid’s section about bike safety and it might be time for you to consider riding your bike to work. It’s a great way to save money on gas and get some extra exercise. You can save about $50 a month in gas, plus additional wear and tear on your car and lose a little weight from this routine. Many cities and counties are reporting a surge in people riding bicycles to work. For example, in Chicago, 3,500 people rode in a spring Bike to Work day, up from 2,800 last year. First, decide if it's practical to ride a bike to work, or to run errands. You'll need to come up with a route suitable for a bike. Do a dry run. Try the commute on a weekend to see how it goes and get a sense of time. That time should stay fairly constant. Don't do a long bike ride too soon. Your bottom will hurt more than you think until you get use to sitting on a bicycle seat and your legs will really ache from pedaling up hills. Start with short trips then build up as your confidence builds. You might think that if you bike to work, you must bike home too. Not true. You can also look into a split trip—using a bus with a bike rack (or the subway) part way then get off and pedal. Or ride your bike to work and take the bus home. There are times when we do need to run out to the store for just one item. These are the times when a bike ride is ideal. It does take a little longer, but you’re supposed to be fitting exercise into your day, right? Why not do both tasks during the same trip? DO NOT listen to music with headphones while cycling. Your ears are like another set of eyes and can keep you safe in traffic. Have a headlight for the front and a light on the back if you ride your bike in the early morning or afternoon/evening. Wear light colored clothing such as reflective vest and safety blinker. Do not let items hang from the handlebars. If you are doing your grocery shopping on bike have a cargo rack or basket. It’s too easy for a bag to get caught in your bike spokes and cause you to crash. Ensure your bicycle is in good working order by inspecting it before each ride. Every living thing needs water to survive. Without water everything, plants, animals, microbes, will perish. As long as there is life on this planet, water will be here. Without it, life as we know it is impossible. Thus it is important for us to know how precious water is. We ought not to waste it or pollute it by any means. Water is just too precious. Our bodies are composed of about 75% water. Water allows our blood to flow through the blood vessels thus supplying the body with vital nutrients and helps waste matter to be eliminated from the body via the excretory system. Water is used for drinking, washing, cleaning and just about any activity we care to do. Water covers about two thirds of the total surface of the earth. The vast expanse of seas and oceans has long been our major sources of food and means of travel. The first civilizations of man started near rivers. The Nile, the Tigris and Euphrates were where man began to establish themselves on the earth. In all parts of the world, the major rivers played a major part in the evolution of man. The rivers, seas and oceans provide man with an important means of travel. In ancient times, man explored the earth via the sea. Much of what we are today are influenced by the travelers who came over the seas in their ships long ago. Today the waterways of the world are still of major importance to mankind. Huge oil tankers, container ships and others ply these routes. Water is our lifeline that bathes us and feeds us. In ancient cultures water represented the very essence of life. The Romans were the first to pipe water into their growing cities, especially with their aqueducts. They also realized that sewage water could cause damage to their people, and needed to be removed from large areas of people. The movement of the oceans also has a direct effect on the atmosphere. The atmosphere is that envelope of gas that keeps organisms living on this planet. Oceans and atmosphere interact to give us weather. 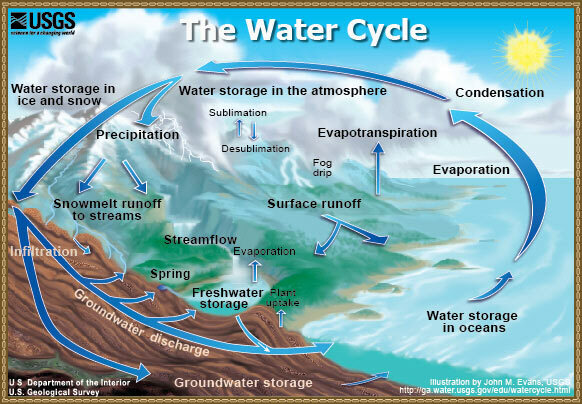 I’ve put a copy of “The Water Cycle” from the USGS, which you probably learned in school. As you can see, water is never used up, it just changes form. Unfortunately, we are making water unusable by our daily practices. Drinking contaminated water can cause certain diseases such as cholera, typhoid fever, malaria, botulism, polio, dysentery, giardia, and hepatitis A. In cities, sewage is sometimes discharged into rivers, where children downstream might be taking a bath or using the water to drink. The simplest treatment for contaminated water is boiling the water for at least one minute and allowing it to cool. But this is not always effective in heavily chemical polluted water supplies. The only organism that doesn’t understand the importance of water is humans, especially in industrialized countries. The oceans have taken a huge beating from the BP oil spill last year. The real estate, fishing and tourist industries were almost destroyed by the spill. Even now with the floods in the south inundating Memphis, TN and possibly New Orleans, are possibly secondary to human’s attempting to control the flow of water in rivers. Water is a resource that should not be taken for granted. It needs to be conserved, just as we save other valuable resources. I’m still amazed when I turn on the faucet and water comes out. Skin cancer is one of the most preventable types of cancer, but it is also one of the most common. The majority of skin cancer cases are caused by being in the sun too much. Over the years, there have been numerous warnings put out trying to tell you about the damage sun can do to your body. For example, you always hear to stay out of the sun when it is at its peak “only mad dogs and Englishmen go out in the noonday sun,” and to always wear sunscreen with a rating of SPF-30 or higher. The amount of sun you get adds up over your life, so the sunburn you get now may cause big problems for your skin when you get older. That’s why it is so important to avoid overexposure to the sun now! Besides the risk of skin cancer you don’t want to end up looking like a walking alligator skin bag. Know how your skin reacts to sun exposure and plan accordingly. Don’t try to get a tan the first day. If you start to turn pink after 30 minutes in the summer sun, then spending only about five to ten minutes in the sun (in a bathing suit) should generate plenty of vitamin D. After that, apply sunscreen, cover up or seek shade. Why is the sun so bad for my skin? Because your exposure to the sun damaging rays adds up, even if you don't burn, the more time you spend in the sun, the greater the chance for skin cancer. A tan is the body's desperate attempt to protect itself from the sun's harmful rays. That’s why people who live in the tropical countries all have naturally darker colored skin to protect them from the constant sunshine. Beside skin cancer, the sun's rays, which include ultraviolet A and ultraviolet B rays (UVA and UVB rays) damages the connecting fibers in your skin which leads to early wrinkles and other skin problems. No. Tanning booths use ultraviolet rays. Makers of the booths may claim that they use "harmless" UVA rays. But both UVA and UVB rays cause skin damage. While UVA rays take longer than UVB rays to damage the skin, they go deeper into the skin than UVB rays which may lead to even more serious skin and medical conditions. Where is skin cancer most likely to occur? Most skin cancers occur on parts of the body that are repeatedly exposed to the sun. These areas include the head and face, neck, tips of the ears, hands, forearms, shoulders, back, chests of men, and the back and lower legs of women. My uncle died from skin cancer. He worked outdoors for the railroad all of his life and then he developed skin cancer which spread throughout his body and eventually killed him. How can I prevent skin cancer? Avoid being in the sun or using sunlamps. If you ARE going to be in the sun for any length of time, wear clothes made from tight-woven cloth so the sun's rays can't get through to your skin, and stay in the shade when you can. Wear a wide-brimmed hat to protect your face, neck and ears. I never go out for my walk or run without wearing a baseball cap. Remember that clouds and water won't protect you--60% to 80% of the sun's rays can get through clouds and can reach swimmers at least one foot below the surface of the water. The sun's rays can also reflect off of water, snow and white sand. This is why you can get such a serious sunburn even if you are sitting under a beach umbrella or in a cabana. And no, drinking alcohol does NOT prevent sunburn and skin cancer. Should I use sunscreen? Many sunscreens offer no protection from UVA rays, the longer ones, which are responsible for skin damage and aging. Most sunscreens only block ultraviolet B rays, the short ones, which are the rays that stimulate vitamin D production by the skin. It’s important to remember that all sunscreens are not the same. They offer different levels of protection (look at the SPF (sun protection factor) rating on the bottle) and some sunscreen ingredients such as benzophenone can cause skin irritation such as burning, stinging or a rash. But the main danger for sunscreens is that people feel protected and spend more time in strong sunlight because they are using a sunscreen, thereby increasing their skin cancer risk. Aloe: The inner gel of the aloe Vera leaf has been shown to speed the healing of sunburns. Cucumber: slice open a cucumber and wipe it directly onto your skin. You can even eat the slice after you wipe it on your skin. Vitamin E. This nutrient is popular for anti-sunburn activity. A regular dose of vitamin E decreases the inflammation you can get from sunburn. Good food sources of vitamin E include whole grains such as wheat germ, vegetable oils--especially sunflower and soybean oil--and nuts.